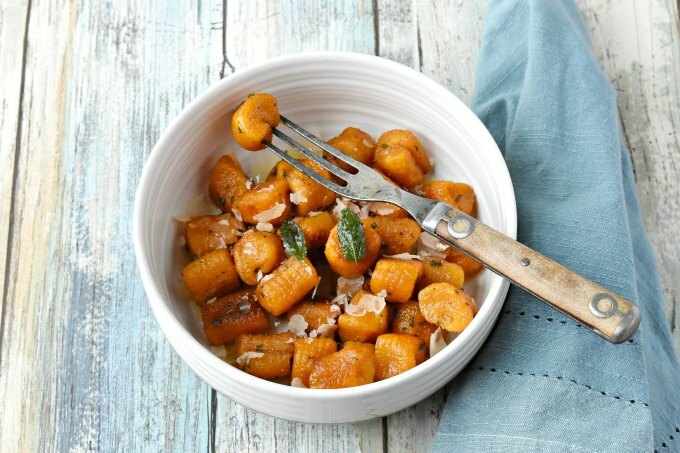 Pillows of pumpkin goodness make Pumpkin Gnocchi with Sage Butter Sauce a truly flavorful pasta dinner. Add some sausage for a more hearty dinner for your family. This post is sponsored in conjunction with PumpkinWeek . I received product samples from sponsor companies to aid in the creation of the PumpkinWeek recipes. All opinions are mine alone. #PumpkinWeek always makes me think of unconventional uses for pumpkin. I know. Gnocchi isn’t THAT unconventional, but it is for me. The hubs seems to think that pumpkin is only for desserts like pumpkin pie and, well, pumpkin pie. Or maybe pumpkin bread or muffins since we had some pumpkin bread the other day at the farmers market. This lead to me purchasing a small loaf for nibbles the rest of the week. However, for me, pumpkin is both a savory squash and a sweet fruit. 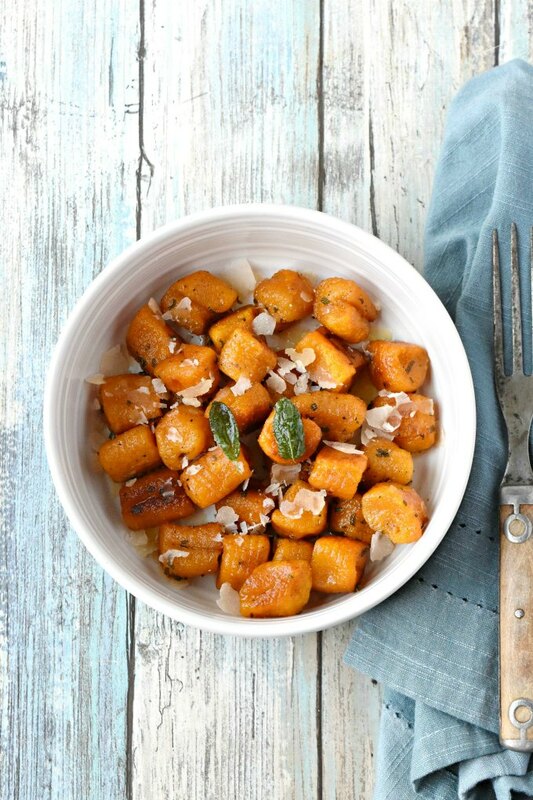 I love that it is savory and meant to be roasted like a butternut or made into hummus, chili, or curry. Oh my. 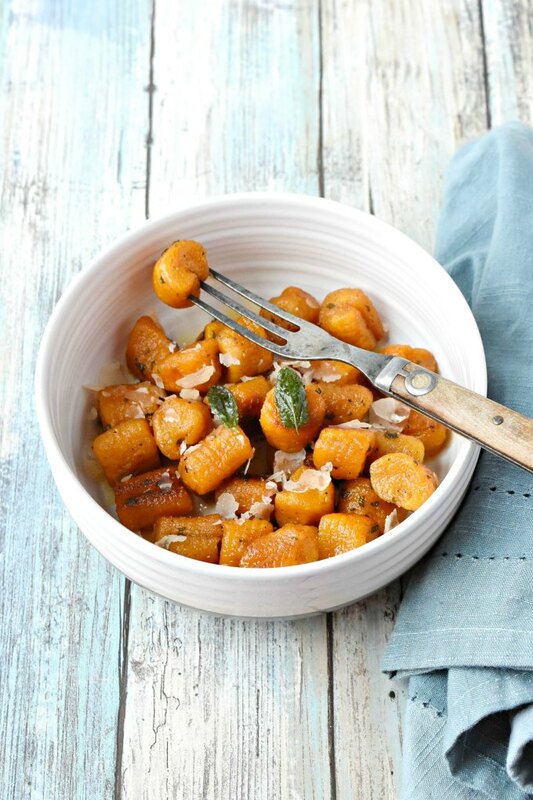 Pumpkin in a curry is DIVINE! Have you tried that? You really should. That subtle sweetness of the pumpkin adds to the spicy and rich flavor of curry. I’m drooling. Is it dinner time yet? Oh, you caught that did you? For those that don’t know, a pumpkin (and almost all squash for that matter) is a fruit. Basically, if it has seeds on the inside it’s a fruit. Yes. A tomato is a fruit. Get over it already. I’ve been dropping that bomb for quite a while now. Most don’t believe me, but look it up. The plant that it grows on is of the vegetable variety, but the actual tomato itself is a fruit. But this post is neither about curry, tomatoes, or sweet pumpkin treats. It’s about making pumpkin gnocchi. And it’s about my first attempt at making gnocchi in general. I have so many firsts in events like this. They always make me want to step out of my comfort zone into new cooking boundaries. I’ve made soft pretzels, hummus (yes but it’s not something I eat or make often), Napoleons, waffles, duck tacos. Heck, my obsession with macaron was started from a blogging event like this one. Yup. The first macaron I published is from an event centered around cooking with alcohol. I should probably remake those. They were pretty darned good. So, you never know what you’re going to learn about yourself when you push yourself in the kitchen. And, events like this typically inspire me to do just that. It also helps that planning starts way ahead of the event so I have time to be more creative. If I had like 2 weeks to plan then I wouldn’t be as creative. Why gnocchi? Don’t ask me! It just popped into my head. I was on the trail of a ravioli, then maybe a fettucine, and then I just landed on gnocchi. It would be pretty easy to make and be something simple to serve up with a browned butter sage sauce. You could even add some Italian sausage or chicken if you wanted and have a more hearty dinner. 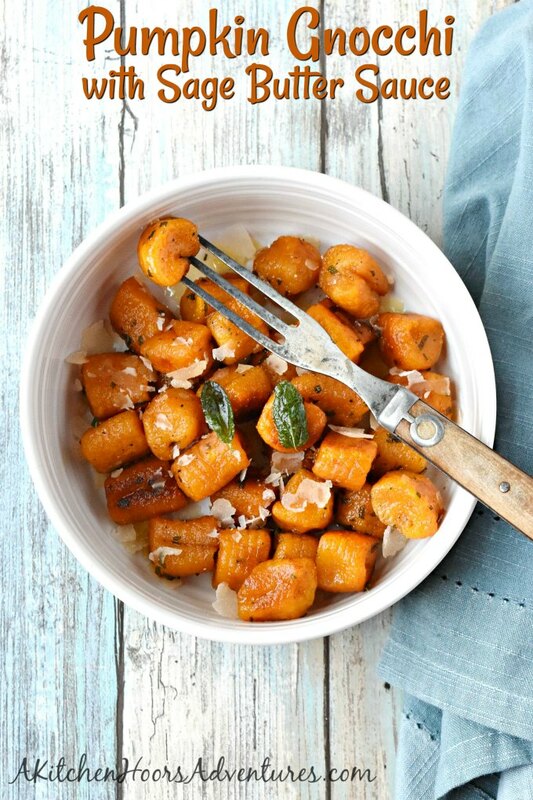 Why does pumpkin and sage or even just gnocchi and sage always seem to go together? I mean, don’t get me wrong. I’m not dissing sage. I use it typically with my pork and chicken. I’m just not sure how it got paired with gnocchi. I should look that up. Be right back! Okay, I didn’t find anything that tells me why they’re always paired together. If you know, I’d love to find out. Things like that always intrigue me. Like peanut butter and banana or peanut butter and jelly? Who in the world thought to put those two things together and make a sandwich out of them? What were they thinking? Or were they just experimenting like we do? Whatever the reason these are typically paired together, they are delicious together. 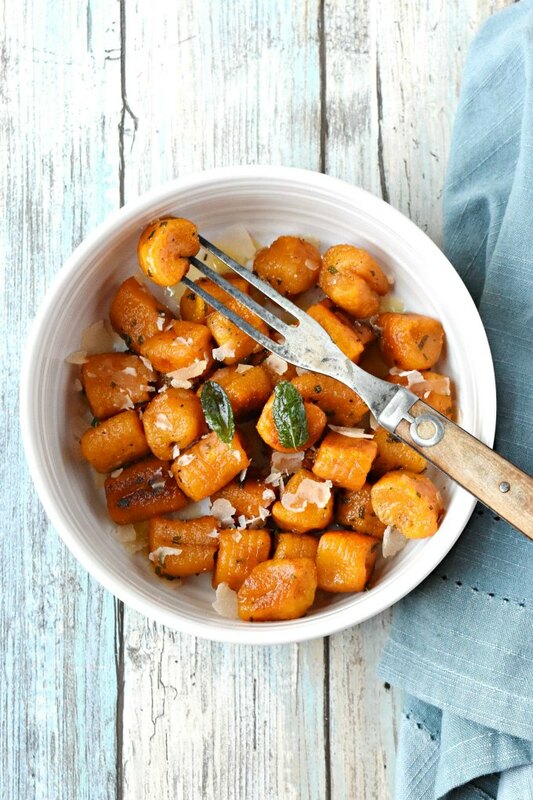 The pumpkin really does come through in the gnocchi. I wasn’t sure it would, but I could really taste it. Then you add the slightly sweet and salty butter and the fragrant sage! Oh my! With so few ingredients in the dough, I wanted to make sure these ingredients are top quality. And that means Eggland’s Best eggs! At first crack, you can tell they’re different. Their shells are not as easy to crack as other eggs from the grocery. It gives you a sense of security that nothing could accidentally get into your eggs. I wonder that sometimes with those easy to crack eggs. I know it seems hard to believe, but they’re also more nutritious than other eggs. They contain more vitamin E, less saturated fat, twice the omega-3s, and six times the amount of vitamin D. I hear ya! “Yeah right!” But with the diet of their chickens, they can easily produce eggs that are better for you. Why would you choose any other egg? The hubs said he wasn’t that hungry, so I boiled up a small batch and tossed them in the browned butter sauce with sage. I tasted a few. I overworked the dough. They weren’t as pillowy as I hoped they could be, but hey! It’s my first time making gnocchi. After the photo shoot, I nibbled on them as I cooked up a few other things this weekend. Then the hubs came into the kitchen and nibble on a few more. Next thing I know, the bowl is empty and we’ve both nibbled them away. Now, I’m more confident in serving these up for dinner. I’d have to add some sausage, of course. The hubs isn’t a fan of meat free meals. Some light Italian sausage would be perfect with these. Just look at that color! And that butter. Oh my. I’m drooling. Are you drooling? Is it dinner time yet? I think I’ve said this before, but honestly these are delicious. Surprisingly so. I say that because I’ve never made gnocchi from scratch before. This is why I can say it’s simple and easy. And quite fun because you have to use your hands. Don’t forget to enter the giveaway! There are some amazing prize packages to be won including something from Eggland’s best eggs. So, do yourself a favor and follow them on social media. It will give you a head start on the entries. Pierce the potato with a fork and microwave on high 3 o 5 minutes or until fork tender. Allow to cool completely before peeling and processing in a ricer. Place the potatoes on a clean work surface and form a large circle. Spread the pumpkin and flour on top. Make a well in the center and add the egg. Lightly beat with a fork before adding the ricotta, and Parmesan cheeses. Get ready to get dirty! 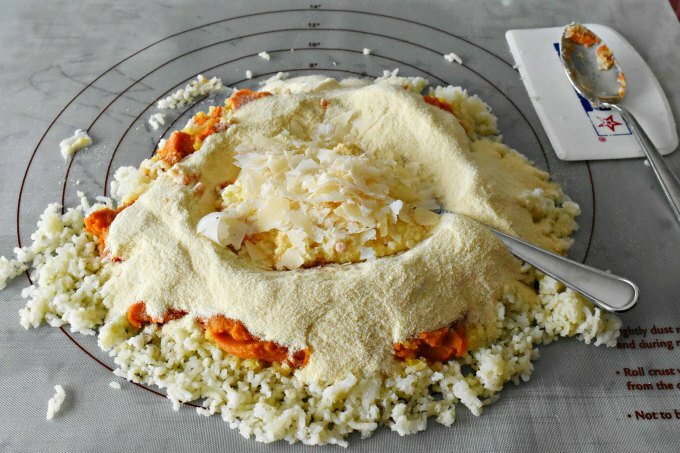 Using your hands, combine the ingredients until the dough begins to form. Knead lightly before shaping into a rectangle. Cut the dough into 6 to 8 pieces. Roll each piece into a rope that’s the same width. For shorter gnocchi, make a thicker rope. For thinner gnocchi, make a longer rope. 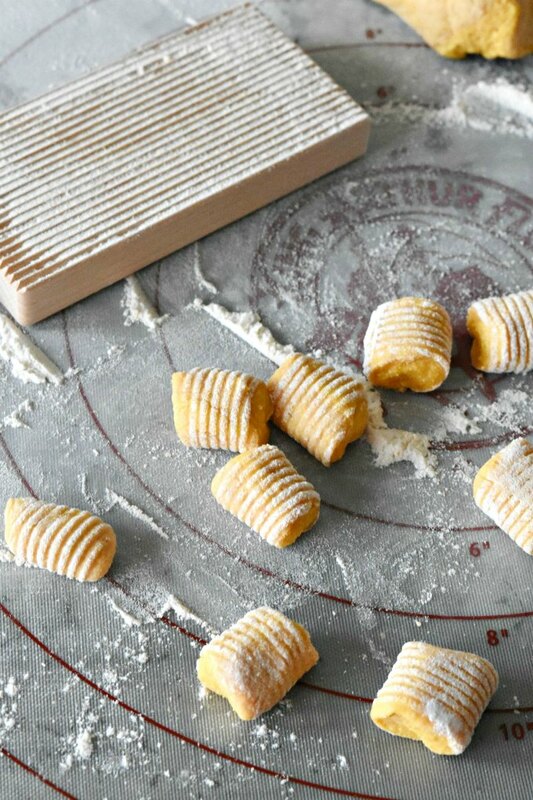 Using a sharp knife, cut the gnocchi into 1 inch pieces. Lightly toss them with flour to keep them from sticking together. It’s not necessary to indent the gnocchi, but it does make for a prettier dish. I purchase a gnocchi board, but you could easily use a fork to gently make indents in the gnocchi. If you do not plan on cooking all the gnocchi right away, place them on t a baking sheet. Make sure they’re separated before sticking them in the freezer. After about an hour, you can move them a zip top freezer back. Do not thaw before cooking. Cook the frozen gnocchi in boiling water and then sauté. 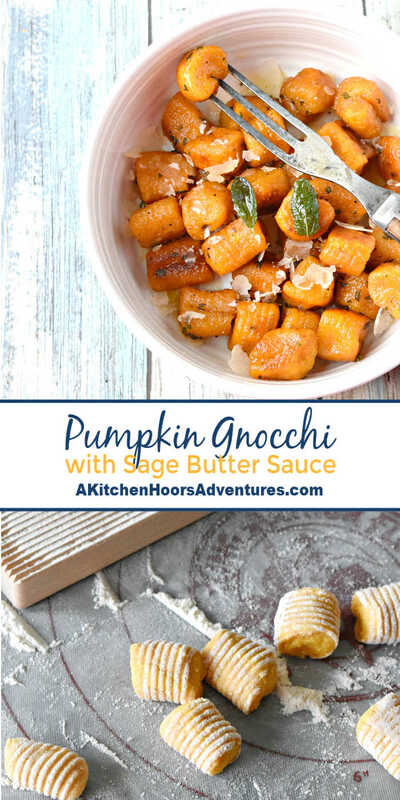 I’m so happy you shared a recipe for gnocchi made with pumpkin rather than gnocchi in a pumpkin sauce. It looks amazing. Great minds think alike, Christie! 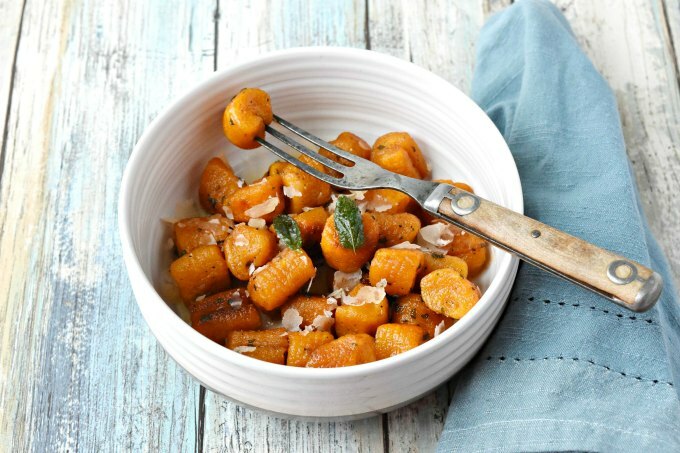 How fun it would have been to get together and have a pumpkin gnocchi cook-off, which I suppose we did, at least in a virtual sense! Congrats on making your own gnocchi as well; we did that in a prior gnocchi recipe and it takes some finesse; looks like you might have some Roman blood flowing through those culinary veins of yours. Beautiful job on this recipe; I wish I had been there to nibble! Thank you! Your sauce looks so creamy and rich. I’ll be trying it for sure!